Salaam Reads / Simon & Schuster Books for You, 9781534418103, 40pp. 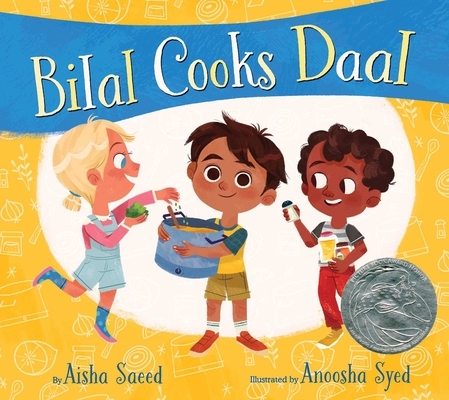 Six-year-old Bilal introduces his friends to his favorite dish—daal!—in this charming picture book that showcases the value of patience, teamwork, community, and sharing. Six-year-old Bilal is excited to help his dad make his favorite food of all-time: daal! The slow-cooked lentil dish from South Asia requires lots of ingredients and a whole lot of waiting. Bilal wants to introduce his friends to daal. They’ve never tried it! As the day goes on, the daal continues to simmer, and more kids join Bilal and his family, waiting to try the tasty dish. And as time passes, Bilal begins to wonder: Will his friends like it as much as he does? This debut picture book by Aisha Saeed, with charming illustrations by Anoosha Syed, uses food as a means of bringing a community together to share in each other’s family traditions. Aisha Saeed is the author of Written in the Stars, which was listed as a best book of 2015 by Bank Street Books, a 2016 YALSA Quick Pick For Reluctant Readers, and named one of the top ten books all Young Georgians Should Read in 2016. She is also the author of the middle grade novel Amal Unbound, which has received starred reviews from Publishers Weekly and Kirkus Reviews and is a Global Read Aloud for 2018. She is also the author of the picture book Bilal Cooks Daal. Aisha is also a founding member of the nonprofit We Need Diverse Books. She has been featured on MTV, Huffington Post, NBC, and the BBC, and her writings have appeared in publications including the journal ALAN and the Orlando Sentinel. Anoosha Syed is a Pakistani-Canadian illustrator and character designer for animation, based in Texas. She graduated with a BFA in illustration at Ceruleum: Ecole d’arts Visuels in Lausanne, Switzerland. Bilal Cooks Daal is her first picture book.